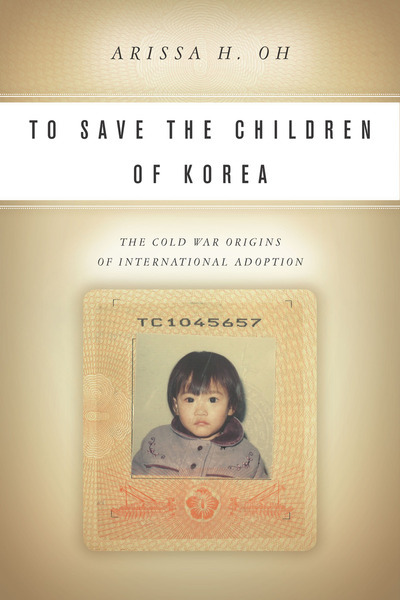 To Save the Children of Korea is the first book about the origins and history of international adoption. Although it has become a commonplace practice in the United States, we know very little about how or why it began, or how or why it developed into the practice that we see today. Arissa Oh argues that international adoption began in the aftermath of the Korean War. First established as an emergency measure through which to evacuate mixed-race "GI babies," it became a mechanism through which the Korean government exported its unwanted children: the poor, the disabled, or those lacking Korean fathers. Focusing on the legal, social, and political systems at work, this book shows how the growth of Korean adoption from the 1950s to the 1980s occurred within the context of the neocolonial U.S.-Korea relationship, and was facilitated by crucial congruencies in American and Korean racial thought, government policies, and nationalisms. It also argues that the international adoption industry played an important but unappreciated part in the so-called Korean "economic miracle." Korean adoption served as a kind of template as international adoption began, in the late 1960s, to expand to new sending and receiving countries. Ultimately, Oh demonstrates that although Korea was not the first place that Americans adopted from internationally, it was the place where organized, systematic international adoption was born.